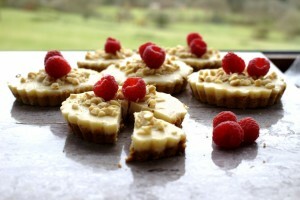 White Chocolate Biscuit Cakes - Delicious and healthy! These white chocolate biscuit cakes are every bit as amazing as they look. I had to exercise some serious self-control not to eat the whole batch myself. I have been dreaming about them ever since I discovered that cacao butter was legal on the Specific Carbohydrate Diet (SCD). Having not eaten chocolate of any kind for over a year and a half, this was kind of a big deal! I wanted to make a wow dessert to enjoy for Easter while the rest of my family is scoffing Easter eggs :). 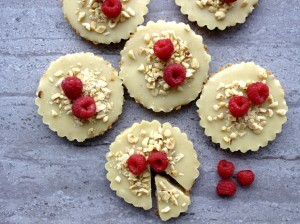 In case you were wondering: white chocolate, hazelnut and raspberries are a pretty amazing combination. My daughter and husband loved these too and would gladly swap these for any sugar-laden cake. Eating these white chocolate biscuit cakes you would certainly get no hint of deprivation. The fact that they are free from: gluten, grains, dairy and refined sugar-free would be quite surprising to anyone who would eat them in a blind taste test. I made six small biscuit cakes in these moulds I found in a cute kitchen shop. If you don’t have these, you could definitely make one larger cake. The best tins to use are ones with ends you can push through once cooked. This will give you the lovely ridge effect on the cakes. You will need to keep these cakes in the freezer as the chocolate will melt at room temperature. Just take one out a few minutes before you eat it. The coldness makes it extra delicious anyway. When I first started SCD, I used to dread big family occasions due to the temptation of so many forbidden foods. Now, I look forward to the baking challenge of constantly baking even tastier desserts than before. Trust me, an SCD Easter is not all that bad at all :)! Delicious white chocolate biscuits cakes free from: gluten, grains, dairy and refined sugar. Paleo and suitable for the Specific Carbohydrate Diet (SCD). Preheat the oven to 160°C Fan, 180°C electric, 350°F or gas mark 4. Grease the pastry tins with coconut oil. Mix together the ingredients for the crust in a blender until combined. Then press the crust into the tin using a spoon and fork. Bake for 15 minutes. Allow to cool for at least one hour before adding the white chocolate topping. (I find leaving them for 2 hours is best). Melt the cacao butter in a heat-proof bowl over a saucepan on hot water on a low heat. Heat until the cacao butter is completely melted. Remove from the heat and add all the other ingredients for the topping. Mix using an electric mixer on high speed for a few minutes until well combined. Pour the topping over the biscuit bases. Freeze for at least 3 hours for best results. Remove the cakes from the freezer a few minutes before serving and top with raspberries and chopped hazelnuts.